SINGAPORE - Amid a frenetic day for the candidates and their supporters on Nomination Day, The Straits Times picks its nine standout moments that provided laughter, controversy and drama aplenty. A 12.30pm deadline largely devoid of any last-minute surprises did at least throw up a trio of intriguing three-cornered contests when all candidates were confirmed. Blogger Han Hui Hui's choice of symbol was a flower as she kept her promise of standing as an independent in Radin Mas SMC. 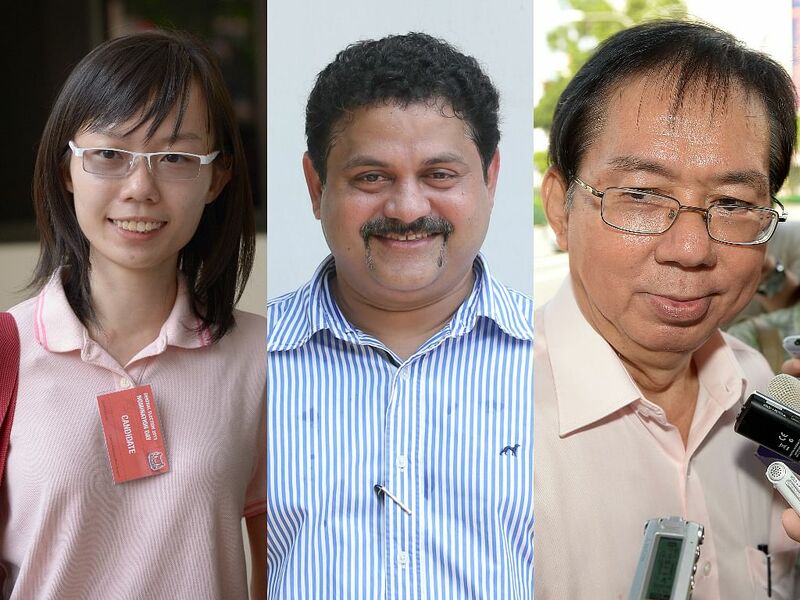 Businessman Samir Salim Neji popped up from nowhere to contest in Bukit Batok SMC. And the National Solidarity Party's on-off love affair with MacPherson SMC was re-ignited when veteran politician and former Singapore Democratic Party MP Cheo Chai Chen entered the fray under NSP's banner. Food has played a substantial supporting role in the lead-up to the general election so far, with politicians debating over the merits of Fengshan Market and Food Centre's orh luak (oyster omelette) and bak chor mee. Thanks to the ST reporters on the ground, we got a glimpse of what some candidates and their supporters had for breakfast to steel them for the hectic morning ahead. 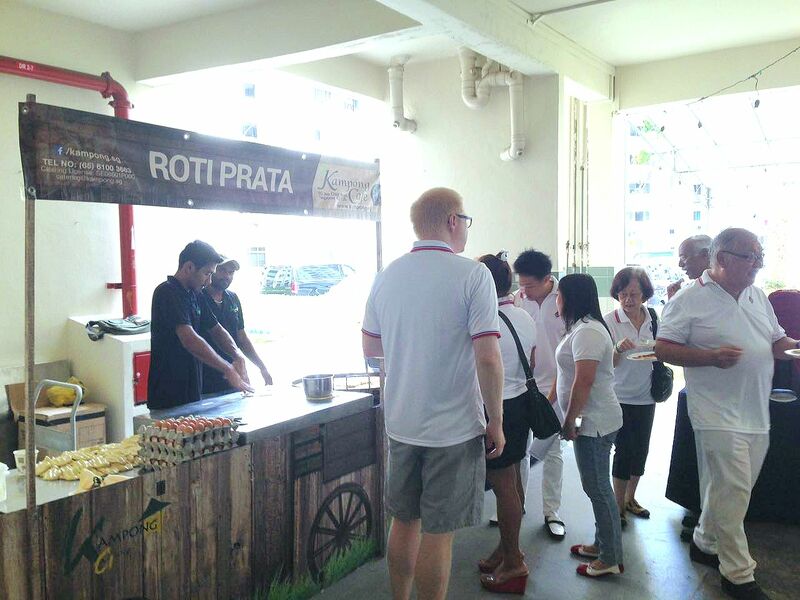 PAP supporters in Punggol East were treated to a spread of buns, porridge and coffee or tea; those at Nee Soon had their fill of roti prata; and the team from Reform Party enjoyed a leisurely meal at a Bishan coffee before heading to their nomination centre. Deputy Prime Minister Tharman Shanmugaratnam also partook in what he called a "common breakfast" of a few eggs, a tomato because "it has lots of vitamin C" and some juice. The WP's Yee Jenn Jong, who is leading a team to contest Marine Parade GRC, ate a bak chang (rice dumpling) that his daughter bought from a famous Peranakan shop in Joo Chiat. The paucity of female politicians was more than made up for by the presence of the candidates' spouses. 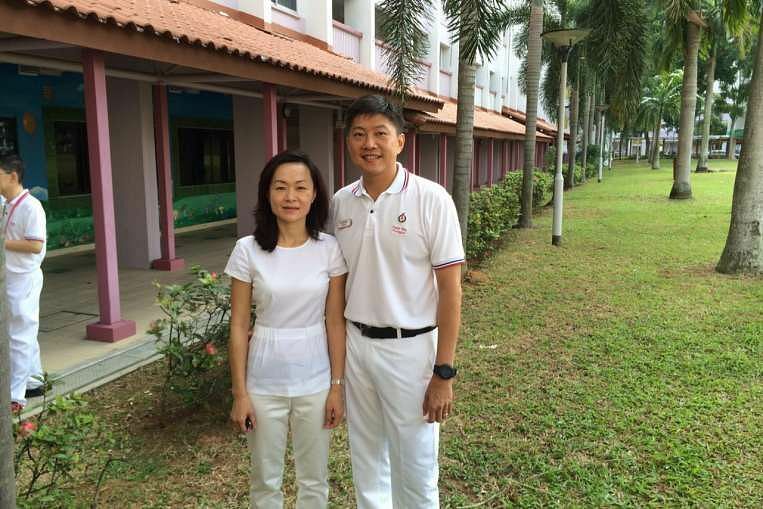 The wives of People's Action Party candidates Ng Chee Meng, Ong Ye Kung, and Lim Wee Kiak, as well as party organising secretary Ng Eng Hen, were all spotted. 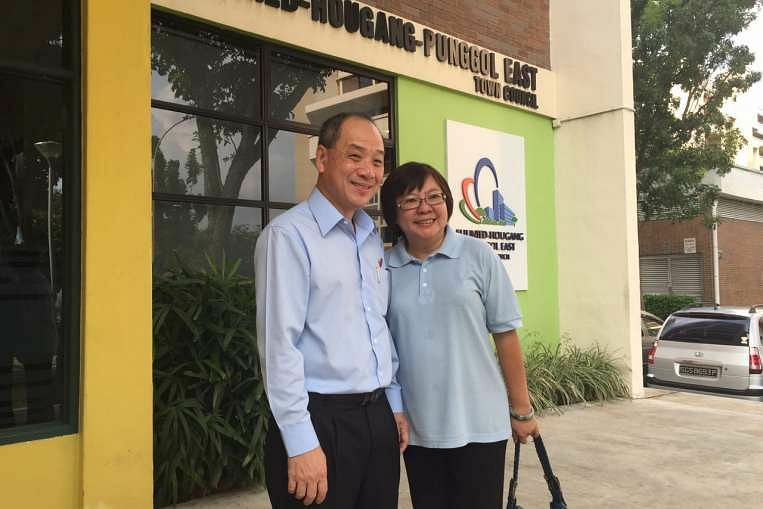 Opposition-wise, Workers' Party chief Low Thia Khiang's wife, Ms Han Mui Keow, made a rare appearance, while Singapore Democratic Party secretary-general Chee Soon Juan was accompanied by his wife, Ms Huang Chih Mei, in the morning. Apart from the serious stuff, a couple of election also-rans also managed to worm their way into a very brief spotlight. Former businessman Zeng Guoyan, aka Parrotman, failed to conjure up his imaginary 15 supporters and the $14,500 deposit despite an early appearance, and everyone's favourite neighbourhood Uber driver Shirwin (Sure-Win) Eu was unable to muster the requisite 10 signatures needed to qualify. 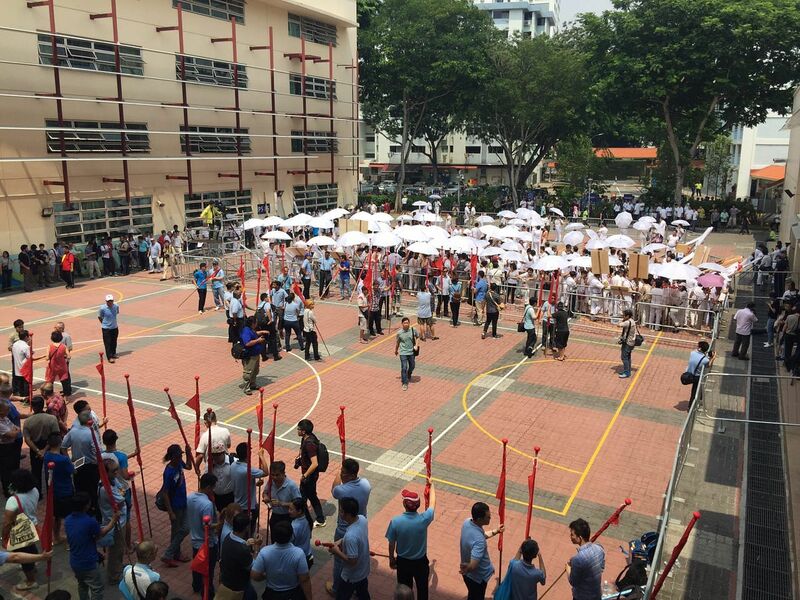 Both parties' supporters came with umbrellas, but only the PAP's got to use theirs as they waited out in the scorching sun at both Fengshan Primary School and Yishun Primary School for the candidates to be announced. With strict rules in place barring the display of party logos and candidates before the 12.30pm deadline, the PAP got around the problem by having two sets of brollies - plain white ones and another with the PAP logo. So PAP supporters could shelter under the plain umbrellas before the deadline while WP supporters bore the brunt of the scorching sun. Surprisingly, it was the PAP candidates who had a hand in ensuring that their party would face contests in all 89 seats in Parliament. An eagle-eyed PAP member spied an error on the Reform Party's nomination forms to contest West Coast GRC and alerted Mr S. Iswaran, who sportingly informed his opponents. "We are not looking to win by default on a technicality - we want a fair fight," he said. Is the suspended lawyer, helming a Reform Party team that includes blogger Roy Ngerng to contest Ang Mo Kio GRC, a PAP supporter in disguise? "Vote PA-Reform Party!" Mr Ravi's embarrassing slip of the tongue - he corrected himself midway through - as he led supporters on a passion-fuelled chant was one of the standout moments at Raffles Institution. 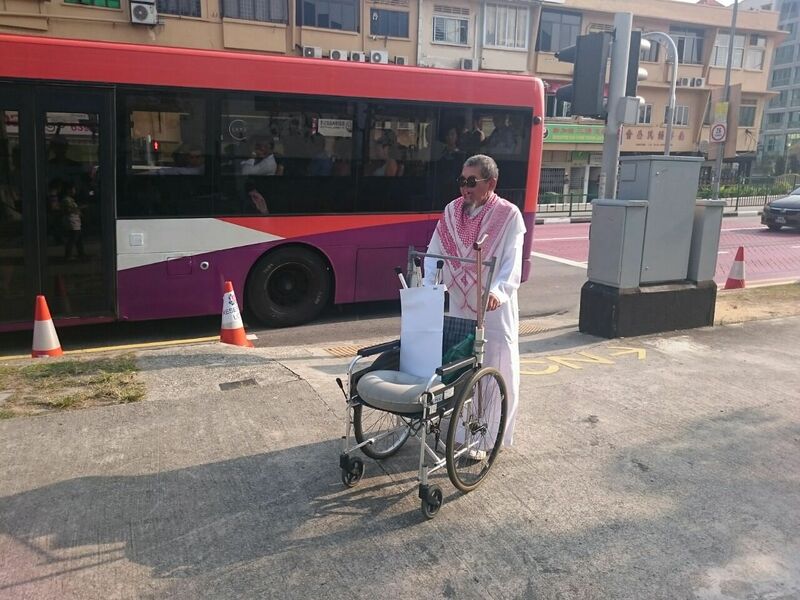 The PAP's "suicide squad" in Aljunied were given a preview of what to expect over the coming days when they were jeered lustily by supporters from the WP during their candidates' speech. Prime Minister Lee Hsien Loong was also on the receiving end of some booing, amid reports of a hostile reception by the opposition for PAP candidates at various nomination centres. PAP's Ng Eng Hen: "Even if you jeer us, we will improve your lives"
Anchor minister for Bishan-Toa Payoh GRC Ng Eng Hen had this comeback: "Even if you jeer against us, we will improve your lives. "And the more you jeer, the more we will continue to improve it even more." There were other instances of sportsmanlike conduct which cast a bright spot on the nomination proceedings. 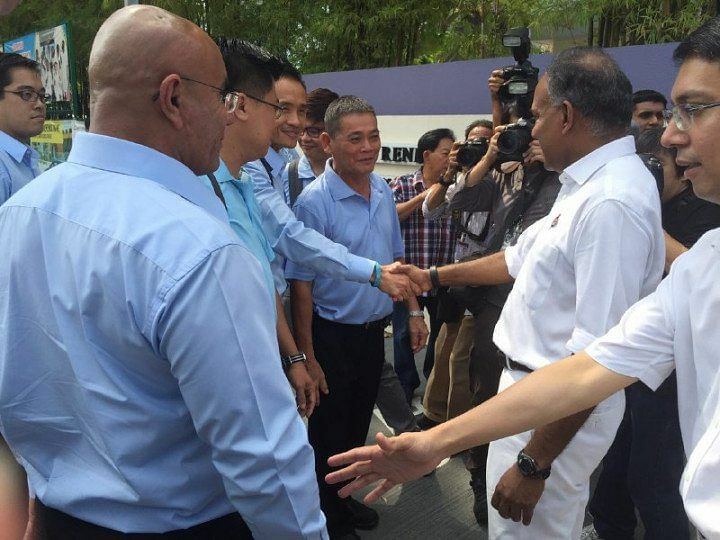 Mr K. Shanmugam, anchor minister for Nee Soon GRC, shared a friendly handshake with WP candidate Kenneth Foo outside their nomination centre, while a PAP supporter was photographed sheltering a wheelchair-bound Chiam See Tong with an umbrella when the latter arrived at Kong Hwa School to support his wife Lina Chiam's nomination for Potong Pasir SMC.